Constructing Yard Number 534 at the John Brown shipyard in Clydebank was truly one of the outstanding achievements in the history of shipbuilding. Unprecedented media interest followed progress on the vast hull taking shape on the banks of the River Clyde. The first British vessel to exceed 1,000 feet in length, she was also the largest moving man-made object built to date. Launched in 1934, RMS Queen Mary was completed two years later. In building the Mary and her consort, Queen Elizabeth, Cunard hoped to recover their, and Britain's, supremacy on the highly competitive North Atlantic passenger sea route. Queen Mary's builder's trials took place in April 1936 amid the estuarial islands of the Clyde, her river of birth, with all eyes especially focussed on her high speed runs off Arran. And perform she did! With a top speed of 32.84 knots recorded, Queen Mary easily satisfied Cunard's requirements and ultimately overcame the challenge of her French arch-rival, Normandie, to hold the prestigious Blue Riband trophy from 1938 until 1952. 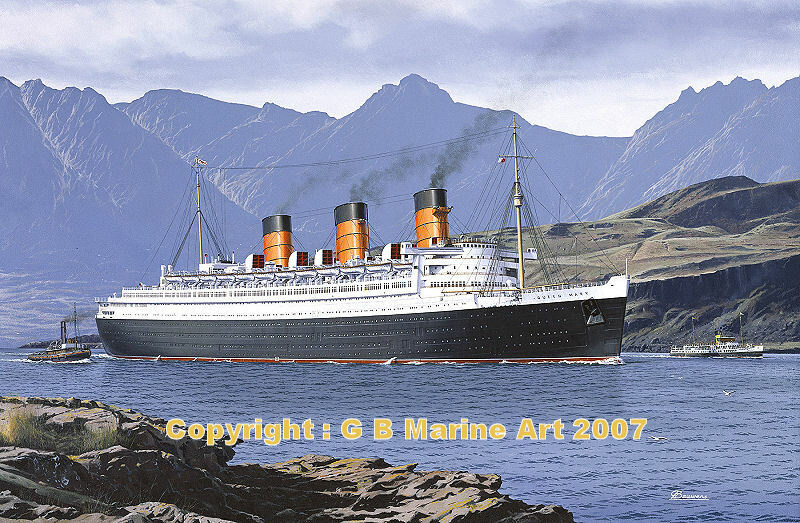 This highly detailed painting by Gordon Bauwens portrays RMS Queen Mary as she returns from sea trials among the scenic islands of the Clyde. In the background, passengers aboard the paddle steamer, Caledonia, enjoy the thrill of encountering the giant new Cunarder at such close quarters. Each of the 300 high quality Limited Edition prints are produced on heavy weight art stock using fade-resistant inks, are artist-signed, and come with matching Certificates of Authenticity. From an original oil painting by Gordon Bauwens showing Cunard's new transatlantic liner completing builders' trials on the Firth of Clyde, April 1936.